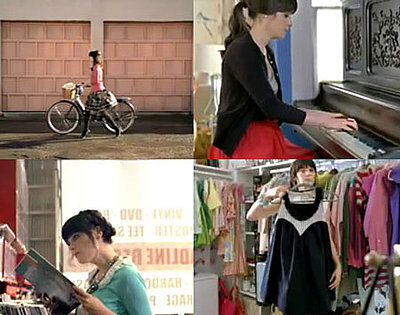 It's no great secret that I totally dig pretty much everything about Zooey Deschanel's style. From her blunt cut bangs to her wardrobe overflowing with vintage finds. If you have been reading this blog for some time, you might remember my, uh, obsession with her wardrobe in 500 Days of Summer. Do you remember the commercials she did for Cotton? Some time has passed but I can't get it off my mind. I especially loved this combo, as it combines two of my favorite things: cardigans & embellished shoes. Here are a few pieces inspired by that ensemble. What do you think of Zooey's style? Is this look something you would wear? Leave a comment! i love her too! i would for sure wear almost anything she was wearing.love the shorts, even though they are a bit short for me. I love her stuff too!!! This is an awesome outfit you put together!